Degenerative disc disease (DDD) is mainly caused by the effects of aging on your spine and specifically on your intervertebral discs. It can also be associated with an injury to the back, but even in that scenario, your discs have usually become weak because of wear and tear on your spine. "Wear and tear" can be considered another way of saying "the effects of aging and daily life on your spine." Before you can feel the result of degenerative disc disease—pain and other symptoms—your discs and other spine structures are changing. This is simply the natural result of the stress and strain each of us puts our backs through every day. You age, your discs change, your bones can be affected, and you can have pain. It helps to think of DDD as a cause and effect process or cascade: One anatomical change occurs, which leads to more degeneration and changes in your spine's structures. These changes combine to cause degenerative disc disease and its symptoms. DDD begins with changes in your intervertebral discs, but eventually it will affect the other motion segments of your vertebrae. The discs and the facet joints are considered the motion segments, which means that they help you move. Over time, the collagen (protein) structure of the annulus fibrosus (that's the outer portion of the intervertebral disc) changes. Additionally, water-attracting molecules—and hence water—in the disc decreases. Both of these changes reduce the disc's ability to handle back movement. The disc will become less spongy and much thinner. 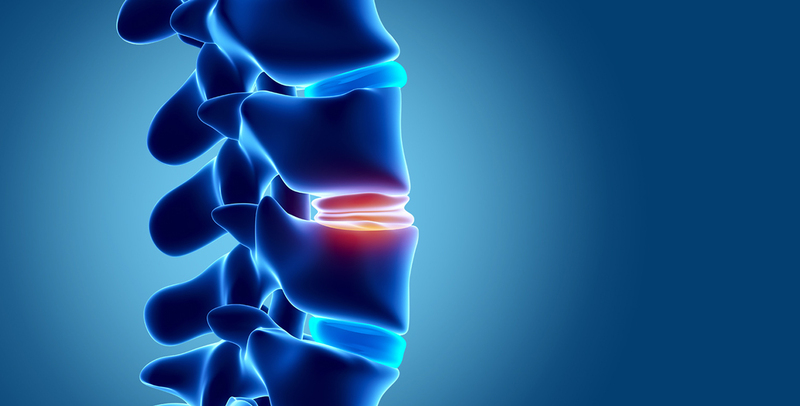 A thinner disc means that the space between the vertebra above and below the disc gets smaller, which causes a new problem, this time with the facet joints. They help stabilize the spine, and if the disc loses height, the way the facet joints move changes. Then the cartilage that protects the facets begins to wear away, and they start to move too much: They "override" and become overly mobile. This hypermobility causes another change in your spine. It tries to stop the movement with the growth of small bony elements called bone spurs (osteophytes). Unfortunately, the bone spurs sometimes pinch nerve structures and cause pain. The bone spurs can narrow the space for the spinal cord and nerves—that disorder is called spinal stenosis. Degenerative disc disease won't cause spinal stenosis in everyone, but it's something you should be aware of if you have DDD. The way you're living could lead to degenerative disc disease. Smoking, for example, adversely affects your discs and can cause them to degenerate faster. Smoking actually decreases the amount of water in your discs, and water is part of what helps your discs absorb movement. With less water content, your intervertebral discs can wear out sooner. If you're concern about experiencing DDD, shedule your free consultation to see one of our expert Seattle chiropractor today!